Products – Memory – MoStash WG02 – Team Research Inc.
With its compact structure, MoStash has become the world’s most unique external storage device for Apple products. Transform it into a stand simply by interlocking the cover with the body of the flash drive, then your iPhone is set and ready for watching videos. 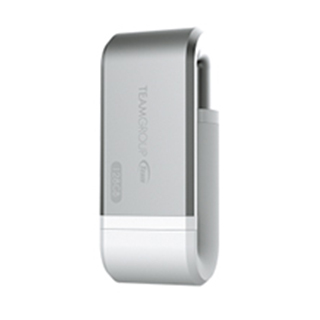 • The World’s 1st iOS flash drive with smart stand for easier iPhone video viewing. • Innovative “Arc-shaped” design can minimize damage caused by collision. • The clever combination of metal and rubber brings us a perfect visual feast. • Instantly extend and free up space for iPhone / iPad. • No internet or iTunes needed for file transferring. • Hide or encrypt your precious and private files for an absolute protection.